Parkinson’s disease (PD) is a chronic and progressive movement disorder affecting nearly 1 million people in the United States, making it the second most common neurodegenerative disorder after Alzheimer’s disease.1 First described almost 200 years ago by James Parkinson, PD has no cure, and therapies to lessen symptoms are limited. The condition involves the malfunctioning and death of neurons, primarily in an area of the brain called the substantia nigra, where the neurotransmitter dopamine is produced. Under normal conditions, dopamine sends messages to the part of the brain that controls movement and coordination. As PD progresses, dopamine production decreases, affecting movement and coordination. A body of research suggests that what individuals eat and drink and the supplements they take also may affect the risk of developing PD and its progression. However, dietary factors are difficult to accurately assess. The association between overall dietary patterns and the risk of PD also was examined as part of the prospective Health Professionals Follow-Up Study and the Nurses’ Health Study. 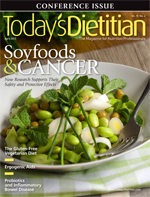 Researchers found that dietary patterns characterized by high intakes of fruits, vegetables, fish, legumes, nuts, and soy were associated with a 25% to 30% lower risk of developing PD.9 It’s unknown whether individual nutrients, such as vitamins C and E and carotenoids, which are concentrated in plant-based diets, are responsible for the observed association because of their role in protecting cells against oxidative damage. Nevertheless, it has been suggested that consuming a mostly plant-based diet may be helpful in the management of PD patients’ motor performances.9 Polyphenols are found in a variety of fruits, vegetables, herbs, cocoa, teas, wines, and juices as well as supplements, and it has been suggested that they may be effective as preventive agents. Coffee consumption is one of the most studied dietary factors related to the development of PD. Researchers have found that caffeine has a neuroprotective effect in animals with chemically induced PD and may explain the apparent protective effect in humans.23,24 Several studies have found that people who consume caffeinated coffee or tea tend to have a lower risk of developing PD and a delayed onset of the disease, but the findings haven’t been consistent. A systematic review and meta-analysis of 26 studies found a 25% lower risk of PD among caffeine consumers. The results also indicated that the higher the intake of caffeine, the lower the risk of PD.25 The association was weaker when only women were considered. Four prospective studies have suggested an association between the consumption of dairy foods and a higher risk of PD development, particularly in men.6,38-40 Increased risk among dairy consumers ranged from 10% to 230%. The greatest associated rise in risk was found in those who consumed more than 16 oz of dairy per day compared with those who consumed no dairy.39 A meta-analysis of the studies found a 60% increased risk in men and women combined, an 80% greater risk in men, and a 30% higher risk in women consuming the most dairy compared with those who consumed the least.38 A prospective study from Finland found a positive association only in women.6 However, a recent case-control study from Japan found no association between intake of dairy products, regardless of gender.41 None of the studies looked at the effect of dairy consumption on symptoms or progression of the disease. In a large cohort study in Finland, those with the highest serum vitamin D concentrations had a 67% reduced risk of PD compared with those with the lowest serum levels.42 In another study, supplemental vitamin D use was associated with a 20% to 30% lower risk of developing PD for doses up to 399 IU/day and more than 400 IU/day, respectively, compared with nonuse.28 In addition, one review of the research suggested that moderate amounts of vitamin D in the diet may help protect against the progression of PD.43 No recommendations have been made, however, for supplementation of vitamin D for either PD prevention or treatment. The availability of low-protein food products makes it easier for patients to adhere to low-protein meals. Several companies offer a variety of products (see below). The research strongly suggests an association between diet and the risk of developing PD later in life. However, the specific dietary prescription to reduce risk, at which stage of life, and for whom it should be prescribed hasn’t yet been identified. However, based on the research to date, maintaining a healthy weight by following a calorie-controlled diet throughout life is prudent. In addition, a plant-based diet has shown some promise and is a rich source of polyphenols, a class of compounds suggested to be beneficial in preventing neurodegeneration. While it isn’t recommended for nondrinkers to begin drinking coffee, there appears to be no reason for regular coffee drinkers to be concerned about increased risk as a result of their coffee consumption; they may, in fact, experience reduced risk. Adequate intake of vitamin D is recommended to support bone health and has been associated with a lower risk of a variety of conditions and diseases, and also may decrease PD risk. For treatment of patients diagnosed with PD, several supplements, such as CoQ10, polyphenols, and vitamin D, are potential subjects of future research, but not enough is known to make supplement recommendations. Regular physical activity, which is recommended for overall good health, also may provide some protection against the development of PD and contribute to an improvement in motor abilities. For patients taking L-dopa, a restricted protein diet or a diet involving the redistribution of protein may help enhance the medication’s effectiveness, but any change in protein intake must be made in consultation with the treating physician in case adjustments to L-dopa dosage are required. 1. Define Parkinson’s disease (PD). 2. Assess some of the complex causes of PD. 3. Evaluate the potential influence diet may have on the risk of developing PD and how to lessen symptom severity. 4. Counsel clients on ways to reduce their risk of developing PD. 1. Parkinson’s disease (PD) involves the malfunctioning and death of neurons, primarily in which area of the brain where the neurotransmitter dopamine is produced? 2. Which of the following factors is proven to increase the risk of developing PD? 3. Research suggests that caffeine reduces the risk of PD in women, but this hypothetical benefit may be prevented by the use of estrogen replacement therapy. 4. Based on the information in this article, which of the following statements is true? a. All cases of PD are caused by an inherited genetic mutation. b. The inherited genetic mutation for PD is rare. c. Environmental factors are not believed to increase the risk of developing PD. d. The child of a parent with PD has a 50% chance of developing the disease. 5. People over the age of 60 have what percentage risk of developing PD? 7. People with PD have been found to have higher serum levels of vitamin D.
8. Research suggests moderate-to-vigorous exercise in general may have a neuroprotective effect against PD development. However, a recent review reported that higher levels of moderate-to-vigorous activity is associated with a lower PD risk during which stage of life? 9. Which dietary pattern has been associated with a reduced risk of developing PD? 10. Which supplement has shown early promise for treatment of PD? 1. Nussbaum RL, Ellis CE. Alzheimer’s disease and Parkinson’s disease. N Engl J Med. 2003;348(14):1356-1364. 2. Understanding Parkinson’s. Parkinson’s Disease Foundation website. http://www.pdf.org/en/understanding_pd. 3. Schults CW, Oakes D, Kieburtz K, et al. Effects of coenzyme Q10 in early Parkinson disease: evidence of slowing of the functional decline. Arch Neurol. 2002;59:1541-1550. 4. Causes. Parkinson’s Disease Foundation website. http://www.pdf.org/en/causes. 5. Kwok JB. Role of epigenetics in Alzheimer’s and Parkinson’s disease. Epigenomics. 2010;2(5):671-682. 6. Sääksjärvi K, Knekt P, Lundqvist A, et al. A cohort study on diet and the risk of Parkinson’s disease: the role of food groups and diet quality. Br J Nutr. 2013;109(2):329-337. 7. Alcalay RN, Gu Y, Mejia-Santana H, Cote L, Marder KS, Scarmeas N. The association between Mediterranean diet adherence and Parkinson’s disease. Mov Disord. 2012;27(6):771-774. 8. Okubo H, Miyake Y, Sasaki S, et al. Dietary patterns and risk of Parkinson’s disease: a case-control study in Japan. Eur J Neurol. 2012;19(5):681-688. 9. Gao X, Chen H, Fung TT, et al. Prospective study of dietary pattern and risk of Parkinson disease. Am J Clin Nutr. 2007;86(5):1486-1494. 10. Chrysohoou C, Panagiotakos DB, Pitsavos C, Das UN, Stefanadis C. Adherence to the Mediterranean diet attenuates inflammation and coagulation process in healthy adults: the ATTICA Study. J Am Coll Cardiol. 2004;44(1):152-158. 11. Martin KR, Appel CL. Polyphenols as dietary supplements: a double-edged sword. Nutr Diet Supp. 2010;2:1-12. 12. Albarracin SL, Stab B, Casas Z, et al. Effects of natural antioxidants in neurodegenerative disease. Nutr Neurosci. 2012;15(1):1-9. 13. Scapagnini G, Vasto S, Abraham NG, Caruso C, Zella D, Fabio G. Modulation of Nrf2/ARE pathway by food polyphenols: a nutritional neuroprotective strategy for cognitive and neurodegenerative disorders. Mol Neurobiol. 2011;44(2):192-201. 14. Martin B, Mattson MP, Maudsley S. Caloric restriction and intermittent fasting: two potential diets for successful brain aging. Ageing Res Rev. 2006;5(3):332-353. 15. Hu G, Jousilahti P, Nissinen A, Antikainen R, Kivipelto M, Tuomilehto J. Body mass index and the risk of Parkinson disease. Neurology. 2006;67(11):1955–1959. 16. Maalouf MA, Rho JM, Mattson MP. The neuroprotective properties of calorie restriction, the ketogenic diet, and ketone bodies. Brain Res Rev. 2009;59(2):293-315. 17. Veech RL, Chance B, Kashiwaya Y, Lardy HA, Cahill GF Jr. Ketone bodies, potential therapeutic uses. IUBMB Life. 2001;51(4):241-247. 18. Kwiterovich PO Jr, Vining EP, Pyzik P, Skolasky R Jr, Freeman JM. Effect of a high-fat ketogenic diet in plasma levels of lipids, lipoproteins and apolipoproteins in children. JAMA. 2003;290(7):912-920. 19. Vanitallie TB, Nonas C, Di Rocco A, Boyar K, Hyams K, Heymsfield SB. Treatment of Parkinson disease with diet-induced hyperketonemia: a feasibility study. Neurology. 2005;64(4):728–730. 20. Stafstrom CE, Rho JM. The ketogenic diet as a treatment paradigm for diverse neurological disorders. Front Pharmacol. 2012;3:59. 21. Henderson ST, Vogel JL, Barr LJ, Garvin F, Jones JJ, Costantini LC. Study of the ketogenic agent AC-1202 in mild to moderate Alzheimer’s disease: a randomized, double-blind, placebo-controlled, multicenter trial. Nutr Metab (Lond). 2009;6:31. 22. Kashiwaya Y, Takeshima T, Mori N, Nakashima K, Clarke K, Veech RL. D-beta-hydroxybutyrate protects neurons in models of Alzheimer’s and Parkinson’s disease. Proc Natl Acad Sci U S A. 2000;97(10):5440-5444. 23. Chen JF, Xu K, Petzer JP, et al. Neuroprotection by caffeine and A(2A) adenosine receptor inactivation in a model of Parkinson’s disease. J Neurosci. 2001;21(10):RC143. 24. Kalda A, Yu L, Oztas E, Chen JF. Novel neuroprotection by caffeine and adenosine A(2A) receptor antagonists in animal models of Parkinson’s disease. J Neurol Sci. 2006;248(1-2):9-15. 25. Costa J, Lunet N, Santos C, Santos J, Vaz-Carneiro A. Caffeine exposure and the risk of Parkinson’s disease: a systematic review and meta-analysis of observational studies. J Alzheimers Dis. 2010;20 Suppl 1:S221-238. 26. Ascherio A, Weisskof MG, O’Reilly EJ, et al. Coffee consumption, gender, and Parkinson’s disease mortality in the cancer prevention study II cohort; the modifying effects of estrogen. Am J Epidemiol. 2004;160(10):977-984. 27. Sääksjärvi K, Knekt P, Rissanen H, Laaksonen MA, Reunanen A, Männistö S. Prospective study of coffee consumption and risk of Parkinson’s disease. Eur J Clin Nutr. 2008;62(7):908-915. 28. Chen H, Zhang SM, Schwartzschild MA, Hernan MA, Willett WC, Ascherio A. Obesity and the risk of Parkinson’s disease. Am J Epidemiol. 2004;159(6):547-555. 29. Abbott RD, Ross GW, White LR, et al. Midlife adiposity and the future risk of Parkinson’s disease. Neurology. 2002;59(7):1051-1057. 30. Hernan MA, Takkouche B, Caamano-Isorna F, Gestal-Otero JJ. A meta-analysis of coffee drinking, cigarette smoking, and the risk of Parkinson’s disease. Ann Neurol. 2002;52(3):276-284. 31. Ross GW, Abbott RD, Petrovitch H, et al. Association of coffee and caffeine intake with the risk of Parkinson’s disease. JAMA. 2000;283(20):2674-2679. 32. Tsuboi Y. Environmental-genetic interactions in the pathogenesis of Parkinson’s disease. Exp Neurobiol. 2012;21(3):123-128. 33. Facheris MF, Schneider NK, Lesnick TG, et al. Coffee, caffeine-related genes, and Parkinson’s disease: a case-control study. Mov Disord. 2008;23(14):2033-2040. 34. Hamza TH, Chen H, Hill-Burns EM, et al. Genome-wide gene-environment study identifies glutamate receptor gene GRIN2A as a Parkinson’s disease modifier gene via interaction with coffee. PLoS Genet. 2011;7(8):e1002237. 35. Kandinov B, Giladi N, Korczyn AD. Smoking and tea consumption delay onset of Parkinson’s disease. Parkinsonism Relat Disord. 2009;15(1):41-46. 36. Hu G, Bidel S, Jousilahti P, Antikainen R, Tuomilehto J. Coffee and tea consumption and the risk of Parkinson’s disease. Mov Disord. 2007;22(15):2242-2248. 37. Tanaka K, Miyake Y, Fukushima W, et al. Intake of Japanese and Chinese teas reduces risk of Parkinson’s disease. Parkinsonism Relat Disord. 2011;17(6):446-450. 38. Chen H, O’Reilly E, McCullough ML, et al. Consumption of dairy products and risk of Parkinson’s disease. Am J Epidemiol. 2007;165(9):998-1006. 39.Park M, Ross GW, Petrovitch H, et al. Consumption of milk and calcium in midlife and the future risk of Parkinson disease. Neurology. 2005;64(6):1047–1051. 40. Chen H, Zhang SM, Hernan MA, Willett WC, Ascherio A. Diet and Parkinson’s disease: a potential role of dairy products in men. Ann Neurol. 2002;52(6):793–801. 41. Miyake Y, Tanaka K, Fukushima W, et al. Lack of association of dairy food, calcium, and vitamin D intake with the risk of Parkinson’s disease: a case-control study in Japan. Parkinsonism Relat Disord. 2011;17(2):112-116. 42. Knekt P, Kilkkinen A, Rissanen H, Marniemi J, Sääksjärvi K, Heliövaara M. Serum vitamin D and the risk of Parkinson’s disease. Arch Neurol. 2010;67(7):808-811. 43. Seidl SE, Potashkin JA. The promise of neuroprotective agents in Parkinson’s disease. Front Neurol. 2011;2:68. 44. Prasad KN, Cole WC, Kumar B. Multiple antioxidants in the prevention and treatment of Parkinson’s disease. J Am Coll Nutr. 1999;18(5):413-423. 45. Storch A, Jost WH, Vieregge P, et al. Randomized, double-blind, placebo-controlled trial on symptomatic effects of coenzyme Q(10) in Parkinson disease. Arch Neurol. 2007;64(7):938-944. 46. Rosenberg RN. Mitochondrial therapy for Parkinson disease. Arch Neurol. 2002;59(10):1529. 47. Zhang SM, Hernan MA, Chen H, Spiegelman D, Willett WC, Ascherio A. Intakes of vitamins E and C, carotenoids, vitamin supplements, and PD risk. Neurology. 2002;59:1161-1169. 48. Fahn S. A pilot trial of high-dose alpha-tocopherol and ascorbate in early Parkinson’s disease. Ann Neurol. 1992;32 Suppl:S128-132. 49. Effects of tocopherol and deprenyl on the progression of disability in early Parkinson’s disease. The Parkinson Study Group. N Engl J Med. 1993;328(3):176-183. 50. Ahlskog JE. Does vigorous exercise have a neuroprotective effect in Parkinson disease? Neurology. 2011;77:288-294. 51. Yoon MC, Shin MS, Kim TS, et al. Treadmill exercise suppresses nigrostriatal dopaminergic neuronal loss in 6-hydroxydopamine-induced Parkinson’s rats. Neurosci Lett. 2007;423(1):12-17. 52. Choe MA, Koo BS, An JG, Jeon S. Effects of treadmill exercise on the recovery of dopaminergic neuron loss and muscle atrophy in the 6-OHDA lesioned Parkinson’s Disease rat model. Korean J Physiol Pharmacol. 2012;16(5):305-312. 53. Xu Q, Park Y, Huang X, et al. Physical activities and future risk of Parkinson disease. Neurology. 2010;75:341-348. 54. Uc EY, Doerschug K, Mehta S, et al. Cardiovascular fitness and cognition in mild-moderate Parkinson’s disease. Neurology. 2008;70:A290. 55. Mamikonyan E, Moberg PJ, Siderowf A, et al. Mild cognitive impairment is common in Parkinson’s disease patients with normal Mini-Mental State Examination (MMSE) scores. Parkinsonism Relat Disord. 2009:15:226-231. 56. Buter TC, van den Hout A, Matthews FE, Larsen JP, Brayne C, Aarsland D. Dementia and survival in Parkinson disease: a 12-year population study. Neurology. 2008;70(13):1017-1022. 57. Olanow CW, Stern MB, Sethi K. The scientific and clinical basis for the treatment of Parkinson disease (2009). Neurology. 2009;72(21 Suppl 4):S1-S136. 58. Baroni L, Bonetto C, Tessan F, et al. Pilot dietary study with normoproteic protein-redistributed plant-food diet and motor performance in patients with Parkinson’s disease. Nutr Neurosci. 2011;14(1):1-9. 59. Cereda E, Barichella M, Pedrolli C, Pezzoli G. Low-protein and protein-redistribution diets for Parkinson’s disease patients with motor fluctuations: a systematic review. Mov Disord. 2010:13;2021-2034. 60. Wolfe RR, Miller SL, Miller KB. Optimal protein intake in the elderly. Clin Nutr. 2008;27(5):675-684. 61. Barichella M, Marczewska A, De Notaris R, et al. Special low-protein foods ameliorate postprandial off in patients with advanced Parkinson’s disease. Mov Disord. 2006;21(10):1682-1687.